It is a balloon of silicone that is inserted in the stomach and is filled with a sterilized saline solution which takes a large space in the stomach. And so gives the patient a feeling of fullness and satiety. Who is the best candidate for the gastric balloon? The best candidate is the obese patient who has an increase in weight than the ideal less than 30 kg. Or his BMI (weight/(length)2) less than 30 and failed in weight loss by diet or practising exercises. *Time of inserting balloon takes about 10 minutes and it remains in the stomach for 6 months, in this time, the patient achieves his goal in weight loss. Some kinds of balloons remain for a year in the stomach. -Gastric balloon is a non-surgical procedure performed in a few minutes under the influence of local anaesthesia. -The cost of the gastric balloon varies depending on the type of balloon and the cost of the hospital in which the balloon is inserted. -Is the gastric balloon suitable for those who have localized fat accumulations? Unfortunately, the gastric balloon is not suitable for those with localized fat accumulations in different areas of the body. It is also not suitable for those who have an increase in weight than the ideal more than 40 kg. Also, who suffers from inflammation and stomach ulcers, does not fit the gastric balloon procedure because of the possibility of stomach complications. 1.Easy procedure. With just Local anaesthesia. 2-A quick non-surgical operation takes no more than a few minutes. 3-Achieves great results in weight loss. The patient loses more than 80% of the weight after the procedure. 4-The patient gets rid of many complications of obesity, like diabetes mellitus type II, hypertension and others. 1-You must adhere to a strict diet after placing the balloon so that the weight gain does not occur again. 2-The probability of infection of the stomach and gastrointestinal tract with the infections due to the contact of the medical instruments with the stomach during the balloon insertion. 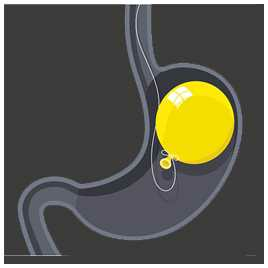 3-The maximum duration of the balloon's presence in the stomach is a year depending on its type so that no damage from the stomach acid secretions. 4-The probability of the growth of bacteria within the fluid inside the balloon, and thus the probability of infection and high temperature. 5-In some minor cases, bouts of colic and frequent feeling of nausea and vomiting. 6-The probability of the balloon exposure to the puncture before the time set for remaining in the stomach. 7-The probability of complications during the phase of the balloon disposal of the stomach.